Use this ‘Breakeven Analysis With Charts’ to help you calculate how much you need to sell before you can begin to make a profit. Breakeven analysis helps you calculate how much you need to sell before you can begin to make a profit. 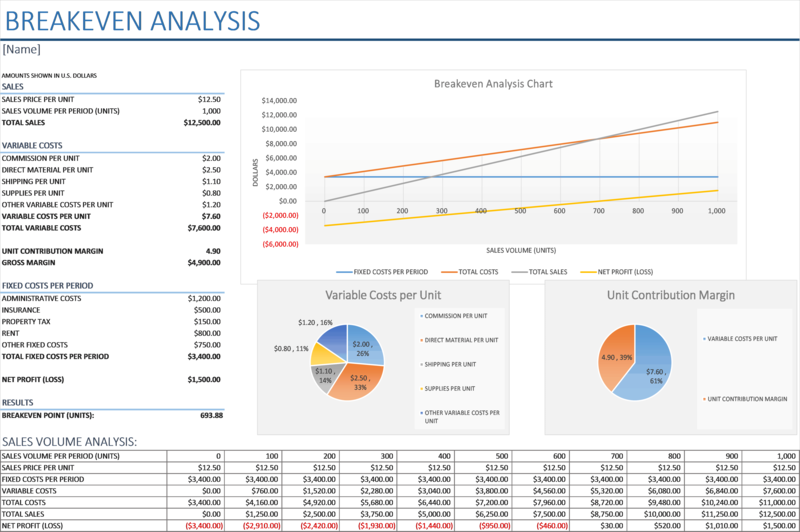 With this break even analysis template, you can also see how fixed costs, prices, volume and other factors affect your net profit. …with this Breakeven Analysis With Charts template you will be adding an essential tool to help you manage your business and ensure your business has access to money when you need it. …with this sleek breakeven analysis template with charts. It’s well designed so you don’t need to worry about layout or formulas, as we have taken care of all of this for you. Simply plug in the values and see what it takes to break even. …to help you calculate how much you need to sell before you can begin to make a profit. Ready for you to start using right away!